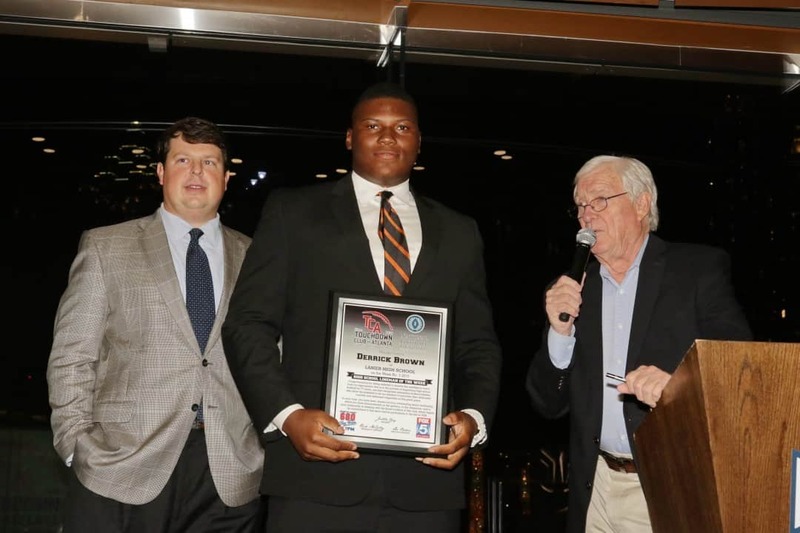 Derrick Brown, Lanier High School. DT 6’4” 322 Lbs. ESPN rates Derrick as the top player in the state of Georgia. The big guy is a US Army All-American and an AJC Super 11 selection. In a matchup against an undefeated and region rival Loganville, Brown was outstanding. At his DT position against the run, he recorded 10 tackles with one assist including four TFLs. These went along with his pass defense stats of five tipped balls, one sack, and one interception that he rumbled 31 yards for a decisive touchdown to ice the game for his undefeated Lanier Longhorns. For this dominant performance, Derrick Brown has been named our Defensive Lineman of the Week.